So there you have it. Chelsea's struggles at Newcastle continue as the Magpies pull off a surprise draw on a day when 35 goals have flown in during eight Premier League matches. You can get more reaction and analysis during Match of the Day Social, which will start on the BBC Sport website at 22:15 BST, while Match of the Day will start on BBC One at 22:30. So where does this result leave Chelsea? Well, the reigning champions are 15th in defence of their title and eight points off leaders Manchester United. Who would have expected that? Newcastle boss Steve McClaren on Sky Sports: "We were so close to a great win. "We looked a team today. That was more like it. "You need a target man to play off and Aleksandar Mitrovic was a constant thorn in Chelsea's back four. "That's the benchmark now. That's the standard, that's what you need to give the crowd. Inch by inch that belief will grow." Newcastle manager Steve McClaren on MOTD: "A good result and a great performance, that's what we wanted. It's been a tough week and there was lots of pressure on the players today. "That was more like it. We expect and demand a performance like that and they got the crowd behind them. "You could see a determination in the players. Against the odds we grew into the game. The players showed real courage. "Aleksandar Mitrovic has been missed and he can be a talisman for us. He is annoyed he hadn't scored but he can make a real difference for us." Newcastle took plenty of stick before this game but no-one could question their effort today. As a team they covered 115.61 kilometres compared to Chelsea's 113.22km. Magpies striker Ayoze Perez covered the most ground for the home side by running 11.82km, while Blues midfielder Cesc Fabregas was the player who covered the most distance with 12km. Great point for Chelsea - how important could that be at the end of the season. Could just save them from relegation. Chelsea manager Jose Mourinho speaking to Match of the Day: "We were so poor, so bad in the first half. It is possible to win the game with a good period but when yo don't play for 45 minutes it's very difficult. "I told the players at half time that I have no time to ask them why they were so bad. I want to try to understand because I don't accept it. "I am not a magician. I tried my best for the team. At half-time I said I was sorry I only had three subs as I wanted to change six. "You cannot say that I react negatively, I complain, I am a critic. I laugh about it." Newcastle United have won three and drawn one of their last four Premier League home games against Chelsea. Chelsea manager Jose Mourinho on Sky Sports: "It is a point. That's what we got. Better than to lose but I'm never happy when I don't win matches. "In the first half from 0-10, we were -1. Minus one. It was that bad. In the second half we played very well. Ramires and Willian moved the game, they brought more intensity, were much more dynamic. Newcastle could not cope with it. "The referee stops the game too much, but we knew that. We know what he is like. "I have to try to understand why they can play so bad in one half and so well in the other. We were bad in every aspect of the game. Poor individual performances and it was impossible to be a competitive team. "We missed Costa, of course." FK: Well, I guess Jose Mourinho is a specialist in failure at St James' Park. He's failed to win in six attempts. Chelsea defender Branislav Ivanovic: "A difficult day. We know how hard it is in this kind of game. We always have bad results here. We did not start well but we reacted and dominated. We have a couple of chances to win it but in the end we have to play all of our season like we did at the second half. "Everyone around the world knows how difficult the Premier League is. Every team is difficult to play and we expect lots of exciting games. It is getting harder and harder." The four goals in this game meant that 35 were scored in total in the Premier League today – the last time there was more was on 19th May 2013 (36). Newcastle are still without a league win this season but that was an impressive performance against Chelsea which not only belied their position of second-from-bottom in the Premier League but will have their fans wondering - why couldn't you perform like that earlier in the season? It had all the things they have been missing for much of the campaign - hard work, passion and goals. The stats said this would be a difficult game for Chelsea but I'm not sure how many people thought that would be the case judging by Newcastle's lack of form. But the Magpies hold on for a point and Chelsea boss Jose Mourinho is still searching for his first win at St James' Park. Newcastle clear a long throw into their area and, in his desperation to get the ball back, Pedro fouls Kevin Mbabu and picks up a yellow card. Newcastle get a corner but play it short as they try to hold on for a point. The home side quickly get another corner and it's the same story. Newcastle substitute Siem de Jong is down after a coming together with Ramires. There are going to be four minutes of added time. Ramires is again causing Newcastle trouble again. He gets in a header from close range but Tim Krul palms the effort away. Chelsea have a winner on their minds. Eyobele: Well Newcastle that's what happens when you stop playing and concede stupid Free kicks!! The goal that was coming has come. Willian swings in a free-kick which is missed by everyone, including Magpies keeper Tim Krul, as Chelsea level. Ramires tried to get a head to the free-kick and, even though he didn't, put Krul off enough for the keeper to miss the ball altogether. Aleksandar Mitrovic goes off - and this time he's not sent-off - after putting in a proper shift. he goes off with some motivation hand gestures to his team-mates as Ivan Toney comes on. It could be a matter of time before Chelsea score. Cesc Fabregas pings a ball to release Pedro and he is in on goal but skies his effort over on-rushing keeper Tim Krul and over the Magpies goal. Eden Hazard does what he does best. He twists, turns and jinks his way into a shooting position inside the area only for his effort to be blocked by Chancel Mbemba. What a rocket from Ramires. The sub gathers a ball from Eden Hazard just outside the area and rifles a shot into the top corner. That should create a few nerves in the Newcastle camp. Game on. Kevin Mbabu shoves Eden Hazard and knocks the Chelsea winger off balance and to the floor as the Belgian tries to kink down the right flank. The referee doesn't give the visitors a foul bringing wry smiles from the Chelsea bench. Radamel Falcao is one-on-one with Tim Krul after latching on to a cross but see's his effort saved by the spread-eagled stopper. The goal would have been disallowed for offside but I'm not sure Falcao or Krul knew that. Ramires comes on for Oscar with Chelsea chasing the game. Chelsea winger Pedro might not have known who Kevin Mbabu was before the game but he certainly will now. The Spanish international again fails to get the better of the Swiss youngster and refuses to shake his hand when Mbabu offers to help him up off the ground. Aleksandar Mitrovic controls a ball on his chest only for Chelsea right-back Branislav Ivanovic to catch his fellow Serbian with a high kick. Ivanovic is rightly booked. So can Chelsea stage a comeback to win? The stats don't suggest they can as the Blues haven't won a league game that they have been losing by 2+ goals since Aug 2002 (3-2 at Charlton). Charles Kahanji: The bad spell Chelsea are going through reminds me of the Moyes days. Just when team is showing signs of scoring they concede. Gareth Soye: Has any team ever won the league and been relegated the next season? Asking for a friend. Newcastle's second goal was their first effort on target since they opened the scoring just before half-time. Newcastle had only touched the ball 10 times in the Chelsea half since the interval before the second goal, and the Blues had enjoyed more than 89% of second-half possession. Chelsea manager Jose Mourinho responds to the goal by bringing on Radamel Falcao and Willian for Loic Remy and Nemanja Matic. Lee in Leeds: Chelsea are four world class players off the Champions League and Premier League titles. Zouma and Ivanovic wouldn't get in another top six team. Do you agree Chelsea are short of top talent? Tweet using #bbcfootball now or on the BBC Match of the Day Facebook page. Yes, folks, you read right - 2-0 to Newcastle. Chelsea's defence is again caught out as Wijnaldum steals in to nod in a corner. Joseph Ross: Newcastle playing well? No shock, been good all year. People are blinded by results and not how the team are actually playing. Salman Anjum: This relegation battle is picking up a bit! How long can Jose Mourinho ignore the league table? Have your say on this game now by using #bbcfootball or post on the BBC Match of the Day Facebook page. Christian Evans on Twitter: Wednesday beat Newcastle, Newcastle beat Chelsea = Wednesday better than Chelsea, so when we play Arsenal, should be a doddle! Yes, and Scotland were unofficial World champions in 1967. Jack Colback has soldiered on for a s long as he can and comes off for Gabriel Obertan. Colback's been excellent in his holding midfield role so how big a problem could this be for the home side? Loic Remy gets another chance. This time he's onside as he meets an Oscar cross only to head wide from 12 yards. Newcastle keeper Tim Krul saves a close-range Loic Remy header before gathering the rebound. The assistant flagged Remy for offisde but it was still a decent save. Chelsea dominating possession as they search for an equaliser. Newcastle defending in numbers and this could well be the story of the second half. No changes for either side by the way. Chelsea boss Jose Mourinho is out for the second half before his team and is sat with a very serious expression in his dug-out before the referee gets the second half under way. Vurnon Anita set up Newcastle's goal to provide his first Premier League assist in 51 games, with his last one also coming against Chelsea at St. James’ Park in 2013. Are McClaren's fortunes set to change? What's your reaction to Newcastle leading Chelsea? Kyle Utterson: Not surprised at all expected a massive reaction. Brilliant finish from Perez great to see even Sissoko playing well. Matt Sandry: Chelsea should have watched the Watford v Newcastle highlights from last week to see how its done. Have your say using #bbcfootball now or on the BBC Match of the Day Facebook page. You can also text us from UK mobiles on 81111 - but don't forget to include your name. This graphic showing Newcastle's goal does not show the Chelsea defenders, which is quite appropriate in the circumstances. Vurnon Anita's deep cross was left by Kurt Zouma and Branislav Ivanovic and Ayoze Perez took full advantage to score. Aashish on Twitter: The goalpost did more to prevent that goal than Ivanovic - what waste of space. John Livinus: What is Zouma thinking? Very poor defending. Jay: If the table doesn't lie, are Chelsea the worst Premier League team in London? What have you made of it so far? Have your say using #bbcfootball now or on the BBC Match of the Day Facebook page. You can also text us from UK mobiles on 81111 - but don't forget to include your name. That's not a typo in the scoreline. 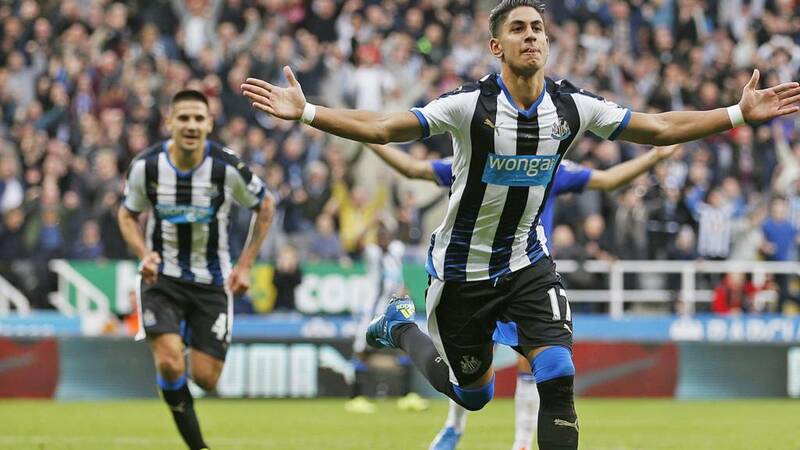 Newcastle are really winning at St James' Park courtesy of an Ayoze Perez goal. I'm not sure I'd like to be in that Chelsea dressing room at half-time. I'm not sure what John Terry and Chelsea manager Jose Mourinho would have made of Kurt Zouma and Branislav Ivanovic allowing Vurnon Anita's cross to fall to Ayoze Perez for that goal but I don't think they will have been too impressed. A cross from the right finds Ayoze Perez in between Chelsea defenders Branislav Ivanovic and Kurt Zouma and the Magpies striker controls the ball before lashing in a shot off the post. Is Chelsea's nightmare form at Newcastle set to continue? Chancel Mbemba nutmegs Oscar but then loses the ball and Chelsea counter with Eden Hazard. He finds Cesc Fabrgas and his well-struck 22-yard strike is palmed away by Magpies keeper Tim Krul. Alfie Snow on Twitter: Wouldn't be surprised at another Chelsea loss, Newcastle will always be our bogey team! Rob Millward: ‏The worst ive seen us play in years... No fight no pace no nothing at the moment... We're been outplayed by NEWCASTLE! Newcastle boss Steve McClaren might be debating how long he can leave Jack Colback on for with the midfielder apparently struggling with an injury. Colback fouls Loic Remy to pick up a yellow card which may come into McClaren's thinking. Newcastle midfielder Jack Colback looks like he struggling with an injury. He's carrying on for the time being. Two chances in quick succession for the Magpies. Daryl Janmaat plays in Ayoze perez but his low shot is straight at Chelsea keeper Asmir Begovic and he parries the ball away. Perez then feeds Janmaat and his effort is also saved by Begovic. Luke Barnard: In a weekend for ending goal droughts, what a time it would be for Begovic to end his! Two years since his last against Southampton! Have your say on Newcastle v Chelsea and all today's action by using #bbcfootball now or on the BBC Match of the Day Facebook page. You can also text us from UK mobiles on 81111 - but don't forget to include your name. Chelsea have seen more of the ball in the opposition's final third so far, but Newcastle have had more possession in the first 25 minutes, and more efforts on goal. Chelsea can't break through the Newcastle back-line at the moment. Pedro makes a run across the box but Georginio Wijnaldum comes away with the ball. Magpies debutant left-back Kevin Mbabu let's Pedro know he's there, so to speak. He clatters into the Spaniard but referee Martin Atkinson keeps his cards in his pocket. Newcastle, it appears, like playing against Chelsea at home. They've frustrated the visitors so far and striker Aleksandar Mitrovic has just headed wide, while Moussa Sissoko has sent a shot wide. Chelsea winger Eden Hazard goes down injured after being caught by Daryl Janmaat. I'm not sure the Chelsea doctor will be rushing to help him after what happened against Swansea when Eva Carneiro and Jon Fearn came on to treat him. Chelsea striker Loic Remy is formerly of the Newcastle parish and it seems some Magpies fans haven't forgiven him for leaving by greeting his touches with a smattering of boos. Chelsea right-back Branislav Ivanovic gets past Georginio Wijnaldum on the right side of the area and squares a ball for striker Loic Remy, who guides a first-time effort just wide. Chelsea manager Jose Mourinho is up out of his seat and gesticulating for his team - I'm guessing he wants a bit more cutting edge in the final third. Seven minutes have now gone and Newcastle's fiery striker Aleksandar Mitrovic hasn't been booked. Is that a record? Magpies midfielder Jack Colback is already putting himself about. He dispossess Chelsea midfielder on the right wing. Magpies midfielder Jack Colback concedes a free-kick for a foul on Nemanja Matic about 35-yards out. Chelsea centre-back Kurt Zouma step up - yes Kurt Zouma - and he thunders a shot wide. You wouldn't want to get in the way of that but Zouma's effort just lacks direction. "The thing about Jose Mourinho and the siege mentality, it doesn't work every single minute of every day. Encourage them to play again, because when they do, they're the best in the league." Chelsea boss Jose Mourinho and Newcastle counterpart Steve McClaren share a joke or two before taking their seats in the dug-out. Let's see if they're as friendly with each other at full-time. If Chelsea need any extra motivation then all they need to do is look at Manchester City's result today. City were beaten at Tottenham and are now second in the Premier League after being overtaken by Manchester United, who beat Sunderland. Chelsea were 11 points off the top of the table after a defeat at Everton but that will be six points if they win at Newcastle. Louis van Gaal told us all the other day that Manchester United were contenders. Today he may just have been proved right, with his side back on top of the Premier League for the first time since August 2013… 770 days ago. And, while Chelsea are the current champions, they’ve been hit and miss so far this season… which leads us to this evening’s vote - who will finish higher, Chelsea or Manchester United? You can vote on this page. Newcastle United have won their last three Premier League home games against Chelsea, so can they cause another shock? "Why do you think Alan Pardew left? He saw it coming. I think they will stick with Steve McClaren because you sack the manager and it doesn't work, they just keep sinking and sinking and sinking." There is trouble in the north east with Newcastle are second-from-bottom of the top flight with their rivals Sunderland the only team below them. "There’s not been much to get optimistic about for Newcastle or Sunderland. It’s a very miserable time for both clubs," The Telegraph’s North East reporter Luke Edwards told BBC Radio 5 live last night. "The key difference is Sunderland expected a relegation battle but with Newcastle, Mike Ashley promised they’d have a go at things this season and there was positivity that something had changed. That’s vanished. "It’s made it worse because Newcastle fans thought this season was going to be different. But it’s worse than ever. There’s usually a honeymoon period but that hasn’t happened." "This summer Newcastle spent £50m – they had to spend at least that to get them back to a level they were at five or six years ago. But they’re nowhere near that level. A few of their foreign signings won’t have experienced what it’s like to play at St James’ Park when they’re losing." Chelsea make only one change from their win against Arsenal last week. Diego Costa starts his three-game ban so Loic Remy comes in up front. John Terry stays on the bench, as does Radamel Falcao. Starting XI: Begovic, Ivanovic, Zouma, Cahill, Azpilicueta, Matic, Fabregas, Pedro, Oscar, Hazard, Remy. Chelsea boss Jose Mourinho was in the same under-pressure boat as Steve McClaren recently but a win over London rivals Arsenal last week helped him out in a big way. The reigning champions will hope to build on that at Newcastle this evening but Jose will have to do something he has never done before - win at St James' Park. According to Magpies boss Steve McClaren, things aren't at crisis point yet following a poor start to the season but they're getting there - and fast. So, can McClaren halt his side's slide and ease the pressure on his shoulders? If the Magpies want to do that be getting three points, McClaren's side will have to do something they have yet to do in six attempts so far this season and that is win a league game. Hello, is that the Football Folk in Trouble (FFIT) hotline? Yes, oh that's good. It's Steve McClaren here. Yes, the same Steve McClaren who rang a few years back when I was in charge of England. I'm in a spot of bother again. I'm Newcastle boss nowadays and my team is second-from-bottom of the Premier League, we've been knocked out of the League Cup by a reserve Sheffield Wednesday side and my players are turning up for matches wearing tuxedos.